Property 3: Your Home Away From Home! Property 7: Family Friendly Home. Clean, comfy, easy parking. Property 8: Cozy retreat on Jack Frost Mountain! Property 10: The Lehigh Lodge - Featured in Philadelphia Magazine - Book Now for Summer! Property 15: Lakefront--Hot Tub, Pool Table, Dock, Boats, WIFI-- !! 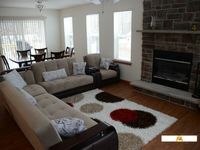 Property 16: Rent the All NEW Pocono Mountain Oasis 2. NEW 7 Person Hot tub & Playground. Property 17: Plan a Pocono Vacation! Low Rates & Linens incl. Close to All Area Attractions! Property 18: A Great Place to Relax & Unwind- Superb 3 Bedroom Home w/ Private Beach Access! Property 19: Blakeslee Forest Retreat w/ Fire Pit & Deck! Take a Holiday - at the Holiday House! Property 22: Take a Holiday - at the Holiday House! Property 23: Walk to Beach, Pool & Clubhouse. Huge Furnished Deck & Grill; Hot-Tub & Sauna! Property 25: Mountain Top Chalet with Fantastic Views, Location, Location, Location! Property 26: Check out the low low mid-week rates! Avoid the crowds at the lifts! Property 27: Come Enjoy Beautiful Pennsylvania and Stay at Our Cozy Home!!! Property 31: Tastefully Decorated, Beautiful Chalet With Hot Tub, Pool Table, and Game Room!! Property 36: Pocono Mountains - Indoor/Outdoor Waterparks, Community Pool 5 min walk! Property 38: Book now for Summer! Property 40: Updated & Private Lake Harmony Home w/ Large Deck! Property 44: Perfect Getaway in Lake Harmony for All Four Seasons! Property 48: True Log House-4BR+Loft/2BA , Game Rm, Close to Lake. Property 49: Lakefront w/Private Dock on Lake Harmony! Close to everything! Property 50: Palmerton Home w/ Deck - 8 Mins to Ski Resort! Very quiet, safe, clean and welcoming house. The community is kid friendly and the nearby lake is a plus. Owner was very accommodating and understanding. Would highly recommend!